If you are a law firm using Microsoft Office 365 and need something extra to complete your document and case management, then Thread is for you. Built in Microsoft Office 365, it gives you a practice management solution with software you already know. Thread is the latest case management software from eXpd8 Ltd, harnessing 30 years’ legal IT industry experience and specifically designed for lawyers and paralegals. CHARLOTTE, N.C. /Mortgage and Finance News/ — If you are a law firm using Microsoft Office 365 and need something extra to complete your document and case management, then Thread is for you. Built in Microsoft Office 365, it gives you a practice management solution with software you already know. Thread is the latest case management software from eXpd8 Ltd, harnessing 30 years’ legal IT industry experience and specifically designed for lawyers and paralegals. Thread was launched at Microsoft’s campus in Charlotte on September 18th and has received tremendous reviews from both paralegals and lawyers. It has been described as disruptive, refreshing, easy to use and at $39 per user per month offers lawyers a very affordable solution to manage their firms’ business and clients. Thread is a brand-new cloud-based legal case management software, built in collaboration with Microsoft which enables legal practices to free up valuable time, be more productive, increase profitability and truly digitally transform their firms. 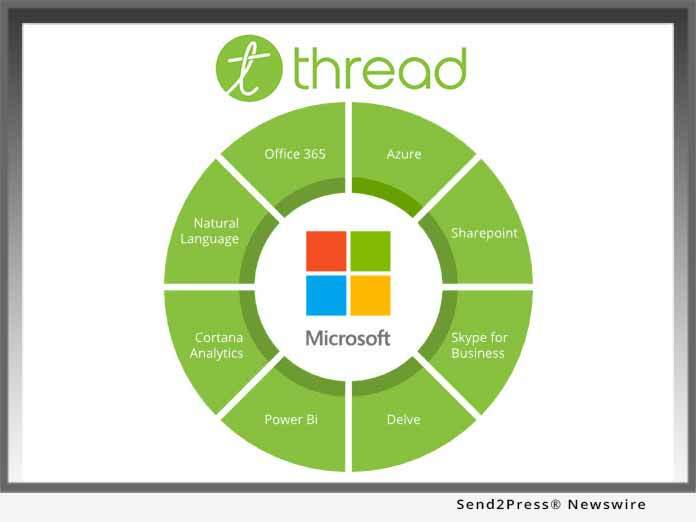 With Microsoft Azure as its foundation, Thread incorporates several Microsoft technologies including Microsoft Office 365, One Drive for Business and SharePoint. This enables Thread to provide law firms with the ability to manage their entire practice smoothly and efficiently whilst also ensuring government level security, compliance and seamless connectivity. Thread brings together all the essentials of a modern legal practice. Growing legal firms need a capable, customizable, yet affordable solution to automate and optimize their entire business in order to survive and thrive in today’s competitive market. Thread can help them do just that. “Thread is truly the missing piece of Microsoft Office 365 for lawyers,” said John Cuddy, Cuddy & Co Solicitors. eXpd8 Ltd, founded in 2001 in Dublin, Ireland was established to provide IT solutions to the legal sector. The Founder, Declan Branagan, recognized a gap in the market to help legal firms be more productive. With a small team and a big vision, the eXpd8 legal case management software was set in motion. There are now over 3,500 users of eXpd8 software around the world and it is the Irish market leader. Founded in 1975, Microsoft (NASDAQ:MSFT) is the worldwide leader in software, services, devices and solutions that help people and businesses realize their full potential. Learn more: http://www.microsoft.com/.